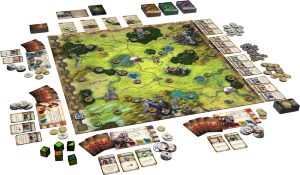 Boardgames like Runebound pack the positive feedback loop gaining power in MMORPGs into a few short hours of a boardgame. This new (3rd) edition of Runebound provides a new-player friendly boardgame where everyone can choose their own character’s path to power. Players can gain in power by questing to explore locations, interact with the denizens of the land, or simply fight monsters. The first player to become powerful enough to defeat the final villain wins the game. With its open-ended options, playing a game of Runebound gives the enjoyment of adventuring in a MMORPG packed into a single evening of face-to-face game play. Once the game begins, players have three actions to use on their turn. Typically these are used to move around the board, shop (in cities), adventure (costs 2 actions), resting up, and train (buy a new ability from skill cards in one’s hand.) In this third edition of the game, a hero’s progression is truly customizable. Rather than simply focus on combat with progressively more difficult monsters, players also choose to pursue exploration quests (move to a location on the board and then roll terrain dice to match,) or social interactions (quests providing one of two options for your hero.) There is even an always-available generic trading “quest” where heroes can earn gold simply moving goods between cities (and is one of the fastest ways to simply earn gold.) Completing quests not only grants a positive result, but also earns a player that quest card as a trophy, which are used to buy skill cards. Each hero obviously has some specialties but these can be improved through almost any of the three quest lines (through quest effects or using the trophies to buy particular skills.) Skill cards in one’s hand can also be used to improve actions within the game. A player can discard a skill card to “exert” in a variety of situations to give themselves a bonus. This is quite useful as drawing a new hand of skill cards costs only a single action. I found the movement and combat in the game particularly interesting. To move, a player can simply take one step in any direction, or they can roll two or more terrain dice. The terrain dice typically show two different terrain types or a wild card. A hero can move through one matching space for each terrain die – a die showing water and hills could be used to take a step over a river or through a hills hex. These dice are also used for resting when in the wilderness, dice are rolled and one health is regained for each terrain that matches your location. Combat is resolved through the use of two-sided cardboard discs. Heroes start with three and gain more through skills and equipment. In combat, characters toss their discs in the air and then take turns using the displayed icons during combat. Icons can cause damage, prevent damage, allow a player to flip other discs, double the value of another disc, or can be used to trigger special abilities. Players (enemy monsters are controlled by the player on your right) alternate choosing a disc and using its powers. Since any one disc has only two sides, and players execute the actions in the order they choose, flipping combat discs limits the randomness of combat and presents a much more strategic (and interesting) battle. The pace of the game is controlled by a game timer track that advances at the end of each round. When the track has completed, Act 2 begins and the track is reset. This can trigger new events or conditions arising from the scenario, but it also serves to increase the difficulty of all monster combat. During Act 2, monsters gain an extra token in combat. Completing Act 2 kicks in special events that depend on the game scenario chosen. The game comes with two main scenarios. 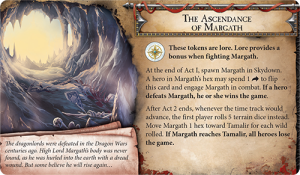 One, The Ascendance of Margath, has a draconic theme and players are encouraged to gather “draconic lore” tokens during the game to weaken the villain in the final battle. At the end of Act 2 he begins rampaging across the map and If the players are slow to challenge him, they can lose the game entirely when the dragon pillages a major village. The other scenario has an undead theme where the main villain spawns zombies throughout the board during the game, and players must gather companion tokens that will weaken him and then defeat him before the end of Act 2, whereupon the players simply lose outright. I love adventure games but they suffer from several fatal flaws. First, they tend to last too long to play. This edition of Runebound is still long, but with the streamed down combat it isn’t as long as some and it doesn’t outstay its welcome. Second, I dislike the problems involved in player vs player combat. While it can be useful to scale back the leader, too often it ends up with the strong preying on the weak. For the most part (with a very minor exception), players cannot harm other players. The main interactions tend to be races to be the first to solve the good quests. Players still get a feel of combating each other, since combat is very much a two player interaction with right hand opponent playing the bad guys. 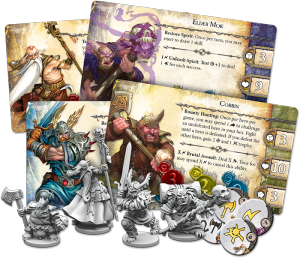 Thus far, the 3rd edition of Runebound manages to keep the heart of a good adventure boardgame: multiple options for progression, the feeling of one’s character getting stronger over time, and a good climactic battle at the end. I love the advancement options – it isn’t simply a slugfest over and over again. It gives me a sense of true roleplaying where I can choose what sort of hero I want to be. Between the six different heroes and two different scenarios, there is enough here to occupy my time before I start eyeing the inevitable expansions. The game includes quite a bit of reading, both for the flavor text as well as the game information. The true test is the game’s complexity. I have found most of the mechanisms straightforward, but the way they interact can be fairly complex. Since players fight against their opponents controllilng the monsters, the skill of one’s opponent can come into play during combat. Playing with large disparities in age may give one player the advantage (since their opponent might not be as good at the combat.) Other than the complexity (which isn’t all that bad, but does probably need a the understanding of an average middle-school kid), the content may be an issue for some. The standard fantasy tropes are involved: undead, dragons, etc… (I can’t recall if there’s any demons or devils in the quests.) The art isn’t so much of an issue, so it is only a problem for those who are sensitive to those sorts of topics.